Bulgaria joined the Tripartite Pact on March 1, 1941. The rapid defeat of Yugoslavia and Greece by the Wehrmacht forces in April 1941 was followed by the provisional annexation to the Bulgarian Tsardom of territories in Western Thrace, south-eastern Macedonia, the islands of Thassos and Samothrace, collectively called the Aegean, Vardar Macedonia, Kosovo and Morava region together with the Western Borderlands, with a total area of ​​39,765.6 square kilometers. The government of Bogdan Filov developed a program to build basic communication in these areas in parallel with the administration, education, economic, cultural and other state institutions. Among them, considerable space was devoted to the construction of railway lines connecting the old boundaries of the Tsardom and the new lands . Bulgaria had railway policy towards the geographical area Macedonia ever since Liberation and the desire for railway connection was characteristic of almost all governments before and after the wars of 1912-1913 and 1915-1918. Although one of the final results – the implementation of a direct railway connection – had not been achieved, the line Sofia-Kyustendil-Gyueshevo was built on the territory of Bulgaria and the border terminus opened on July 16, 1910. During WWI, narrow-gauge (Decauville) railways (600 mm)† for both military and civil use were built along the routes: Skopje-Tetovo-Kichevo reaching the outskirts of Ohrid, Gradsko-Prilep reaching the outskirts of Bitola; Radomir-Dupnitsa-G. Djumaya (today Blagoevgrad)-Kulata reaching a few kilometers from Demir Hisar (today Sidirokastron) and several shorter lines with total length of 671 km or 88.3% of all imported Decauville rolling stock. The state program deemed as essential connecting projects the standard railways Gyueshevo-Kumanovo, Kyustendil-Tsarevo Selo (today Delchevo)-Kochani-Shtip-Gradsko and along the river Struma valley . Between the two world wars, the narrow-gauge line was replaced by the standard line Radomir-Dupnitsa-G. Djumaya and works towards Simitli and Krupnik started in order to reach the Greek border at Kulata . A narrow-gauge line (760 mm) was built in the same period towards the river Mesta Valley from Saranbey (today Septemvri) to Belitsa with a planned terminal Nevrokop (today Gotse Delchev) . This is approximately the reality from which the Bulgarian railway construction in Macedonia started during WWII (1941-1944) and it was the railway policy of the Bulgarian governments that lasted more than half a century but did not show the necessary results. There is a complete continuity between governments that perceived the need for direct communication as an element in the efforts for national unification. The railways Gъrdelitsa-Gevgeli-Skopie, Veles-Bitola-Kremenitsa, Veles-Shtip-Kochani, Skopie-Kachanik-Gъrlitsa, Skopie-Sarakino, a small section in the region of Ohrid and General Zhostov (today Skopie neighborhood Gyorche Petrov)-Orashie operated on the territories annexed from the former kingdom of Yugoslavia. Their total length was about 649 km, of which 590.6 km standard and 57.5 km narrow gauge (600 mm). 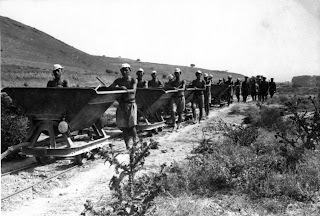 They were assigned to an individual Skopie railway region . In the Aegean, initially the stan­dard lines Poroy-Dedeagach, Mirini-Orfani and a small section of Dede­agach-Odrin came under Bulgarian control, with a total length of 381 km. Military action caused many partial destructions that needed repair; im­prove­ments were made on the quality and intensity of traffic . All these existing lines increased the Bulgarian railway network with more than 1000 km. Connecting lines through Nish (for Vardar Macedonia) and Odrin (for the Aegean), however, remained under foreign control. Furthermore, the link between the Aegean and Vardar Macedonia and the Solun railway junction lay on a territory under foreign control. The newly-acquired lines were practically isolated from direct connection to the railway network in the old Bulgarian borders, which put this issue among the first to be resolved by the Bulgarian government. The time needed to realize the railway connection projects not only forced the Bulgarian government to prompt action, but it also proceeded to the signing of agreements with its neighbours to use existing connections under their power. Germans played a major role, having undoubted interest to control the railway infrastructure for better maneuvering of troops and supplies. Even before the offensive in the Balkans at the end of March 1941 they signed an agreement for the use of the Bulgarian network . Conferences were held in Vienna, where on the newly-acquired territory was introduced a special "Balkan military ticket" . Subsequently, some details were specified in the determination of border stations and freight traffic. Poroy was agreed on as an exchange station on the line Dedeagach-Solun . Another major issue was the taking control in Western Thrace of the operation on the line Dedeagach-Pition by the Bulgarian Railways . The Bulgarian government compromised on keeping the German control on this line . The transfer of the railway Svilengrad-Odrin-Pition to Turkish control caused some tension in the Bulgarian-German relations which was settled through the mediation of Tsar Boris III . Conflicts occured with Italy, which claimed full control of the network in Western Macedonia and Kosovo. It was agreed to set Gъrlitsa as a border station on the route Skopie-Kosovska Mitrovica. Much more difficult were the negotiations for the Decauville line Skopie-Ohrid-Struga-Tashmorunishta conducted on several conferences. A proposal for a complete Italian exploitation of this line was rejected and the government stood up its position that traffic on Bulgarian territory be carried out by the Bulgarian Railways . These frictions did not hinder the discussions between Sofia and Rome for Trans-Balkan projects. Extension of the railway from Bitolya through Struga and Elbasan to the Adriatic Sea, and plans for building the road Durazzo-Skopie-Sofia and an oil pipeline from Ruse through Sofia and Skopie to Durazzo were discussed on an intergovernment level . A joint venture for transportation was planned, and the Italian side undertook to implement the projected line Urosevac-Antivari, which along with the project Gyueshevo-Kumanovo provided connection Sofia-Adriatic . These actions were complemented by the Bulgarian-Romanian signed agreement for the construction of a bridge on the Danube between Russe and Giurgiu and uninterrupted road for Bucharest and further east . The railway infrastructure was of interest also to the enemies of the Tripartite Pact. Key lines and facilities were placed under special surveillance and security in order to prevent possible attacks by allied aircraft or partisan movement. Despite the low traffic capacity the Decauville to River Struma Valley and the continued construction of the standard line, this direction became one of the areas of competition and dominance. For the Bulgarian and German military circles, it was important to preserve the control over it, while Anglo-Americans planned subversive action with the support of local partisan squads around Dupnitsa, Razlog, etc. operating in the Rila-Pirin region . Such was the task of the First Sofia Liberation Brigade while the Kyustendil squad performed sabotage between Radomir and Gyueshevo . The U.S. State Department drafted a post-war development plan of Macedonia, taking into account the existing railway infrastructure along the Struma and Vardar valleys. A possible compromise between Bulgaria and Yugoslavia was assumed, with the new frontier going along the line between the disputed and undisputed areas of ​​1912. In railway terms Vardar Macedonia was divided in two with the north line Ohrid-Skopie-Kumanovo-Kyustendil remaining under the control of Belgrade and the southern line Bitolya-Veles-Shtip-G. Djumaya under the control of Sofia. In this scenario, a very serious Greek opposition was expected, because part of the railway to Solun passed through Bulgarian territory . Intelligence headquarters were competing to analyze weaknesses in other directions, and the Bulgarian intelligence captured an Allied order to the armed resistance in Bulgaria to gather information about specific sites along the lines Skopie-Veles, Veles-Bitolya-Kremenitsa and Skopie-Ohrid. Implementation of the projects Simitli-Demir Hisar, Gyueshevo-Kumanovo, G. Djumaya-Kocani, Momchilgrad-Gyumyurdzina and Sofia-Pernik was monitored with keen interest by the Allieds. .
All the mentioned aspects were certainly elements of the Bulgarian railway policy in Macedonia. The wartime situation and the provisional status of the borders further complicated the plans of Sofia. Despite the negative factors and problems, the government of Bogdan Filov undertook the ambitious task to implement the connection projects that had been frozen for decades. Only ten days after the entry of Bulgarian troops in the newly-annexed territory on May 3, 1941 the Council of Ministers adopted a decree for the exploration, and construction of the railways Momchilgrad-Gyumyurdzina, Kulata-Demir Hisar (Decauville), G. Djumaya-Tsarevo Selo-Kochani and Gyueshevo-Kumanovo began on 1 June the same year . Extremely fast preparatory activities were carried out followed by building the identified facilities on the designed routes. With the exception of Momchilgrad-Gyumyurdzina all routes were on the geographical area of ​​Macedonia. In addition, replacing the Decauville with a standard line along the river Struma valley in the section Simitli-Krupnik, and further to Demir Hisar and the extension of the narrow-gauge along Mesta river basically formed the building policy of the Bulgarian Tsardom at the beginning of the period considered here. In the preparatory period, a discussion went on in Bulgarian society on the need for individual projects and the most rational routes. The directions to Skopie and river Struma valley gained an undisputed consensus. The importance of the railway project Gyueshevo-Kumanovo was well-known, and was met with approval by the population. Such was the attitude towards the construction of the section Kulata-Demir Hisar of the existing Decauville. It was seen as a temporary solution and it was therefore recommended that the whole route Simitli-Demir Hisar be replaced with a standard railway. The main motive for the construction was dictated primarily by the desire for fast and permanent connection with the Aegean for economic and strategic reasons. Both projects had been examined and approved in the past and had also a full public and political support . There was no consensus on the railroad along the valley of the River Bregalnitsa. The direction of the route caused significant problems. The section between Kocani and Tsarevo Selo was without an alternative, while further on the realization of several options to G. Djumaya, Kyustendil, and Dupnitsa was possible. 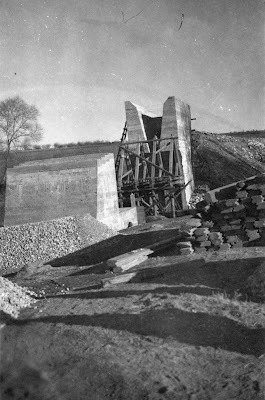 The engineering society supported primarily directions consistent with the geographic realities, and rationally chose the most feasible ones and with a smaller number of man-made structures – bridges and tunnels, with smaller slopes and other positive characteristics. Eng. Andon Prahov came up with a very circumstantial analysis. Four partially overlapping options were compared. The government-favored G. Djumaya – Tsarevo selo had two possible approaches to the Struma Valley towards Bregalnitsa through Vlahina Mountain. The first was downstream Chetirka River and its tributary Klisura, a watershed tunnel under Leshtanska Mountain and climbing down to the river Bregalnitsa; and the second went along the Klisura River with a watershed tunnel under Lukov Peak and descended along the ravines of Tursko Gabrovo. Due to the large slope, the line began about 5 km north of G. Djumaya. The watershed tunnels alone were 2700 m and 3900 m, respectively, located at 750 and 770 m altitude. The first option had a total length of 41 km, and the second had 35.5 km, with the tunnels along totaling about 5 km. The project Kyustendil-Tsarevo selo also incorporated two methods for crossing the main watershed. The most convenient route began at the village Kopilovtsi, passed through the village Kadin bridge (today Nevestino) and along the river Eleshnitsa and its tributary Rechitsa reached the watershed "Black Rock". Thence along the gorge of the village Tursko Gabrovo it descended about 2 km below Tsarevo selo. In the different approaches to "Black Rock" two tunnels were formed, respectively 2280 m and 1980 m, but in the latter case, the station moved about 2.7 km after Tsarevo selo. The total line was 58 km with about 4300 m tunnels. Considerably smaller, only 1350 m, was the watershed tunnel if the Rechitsa Valley was avoided and instead it was continued on along Eleshnitsa to Rakovo village. The connection was made along the Karovitsa River, Selnishki Gorge and Bregalnitsa River and the station was again about 2.7 km below Tsarevo selo. The total length was 61 km with about 2500 m tunnels. This option was significantly worse than the other one through "Black Rock" because it required instead of long tunnels additional man-made structures and steeper gradients. The section Kadin bridge – Tsarevo selo passing through the Piyanets area remained unchanged in the other projects too. This section could be reached from Kyustendil as well as from Boboshevo and Dupnitsa. The first way was along the river Struma, about 16 km long, which is the distance from Kadin bridge to Kyustendil, while 3-4 bridges for crossing the river, and several tunnels were needed for the route from Boboshevo. The route from Dupnitsa to Kadin bridge also requires man-made structures - two tunnels under the watersheds "Bineka" and "Shumnati Peak" along with 7 smaller tunnels with a total length of 2300 m and 3 large bridges over the rivers Dzherman, Razmetanitsa and Struma. The distance from Dupnitsa to Kadin bridge is 24 km and to Tsarevo selo it is 66 km. Eng. A. Prahov recommended that the Government re-analyse all factors, because the destination Kyustendil – Kadin bridge – Tsarevo Selo through the watershed "Black Rock" had a decided advantage. He opposed the political arguments with the law of 1918 and the subsequent surveys conducted by military units . The railway expert analysed the situation from the perspective of natural geographic factors and searched for the most appropriate solutions. For him, the intentions of rulers or vested interests were less important. The political circles, however, had a final say in making decisions. The population of the Piyanets region sent a statement to the Prime Minister and the cabinet ministers. It called for the railway passing from Kyustendil to Tsarevo Selo to cover 36 villages inhabited by about 40,000 people. To meet the annual needs the plan provided for transportation of 10,000 tons goods. Among the items for export were about 10-12,000 tons fruits and 2,000 tons tobacco. There were high capacity oak and pine plantations and mineral resources development. Exploitation of coal, shale oil, and granite was expected to start. Railway building was thought as a necessary elements of raising the welfare of the population which otherwise did not see opportunities for prosperity. A copy of the text was sent to Vice-Chairman of Parliament, the Kyustendil MP Dimitar Peshev . Public in the project area also became involved. The aim was not only to persuade government officials with economic motives but to create a political lobby to modify the original design. The advantages of the Piyanets route created conditions for such support and a controversy in the state institutions. "At 4 o'clock I called Eng Mitov, whom I admonished with the argument that he cannot advocate another building policy, except that of the government and that technical considerations must often defer to the political ones ... "
The monarch and the Prime Minister staunchly supported the realisation of the already approved lines . The opposition coming at different levels and from different backgrounds questioned the correctness of the Cabinet decision. Voices for revision got louder and put on trial the top state officials who preferred firm defense of their position rather than a possible compromise. The lively discussion was carried over to the meetings of the National Assembly. In the bill to expand the country's railway network, the Minister of Public Buildings, Roads and Public Works Eng. Dimitъr Vassilev proposed to build new lines in southwestern Bulgaria and the new territories: the standard lines Simitli-Kulata-Demir Hisar, Gyueshevo-Kumanovo, G. Djumaya-Kochani, Momchilgrad-Gyumyurdzhina, Dupnitsa-Bobov Dol, a second railway from Sofia to Pernik and the Decauville General Todorov-Vetren. Basically, the main points adopted in the decree of the Council of Ministers were confirmed, with a change in the beginning and end of the narrow gauge, but with no substantial changes of the main track. The construction works adopted by the Cabinet were sanctioned by the Parliament. On July 13, 1941 the bill was introduced in the Parliament Hall and presented by Minister D. Vassilev. Prepared, perhaps, from the publicly expressed opinions, he tried at the outset to counter any opposition by showing the gradation of the main factors in railway construction as supported by the government. He listed the following reasons as the most important ones: first – policy, second – military, third – technical, fourth – economic, fifth – operational, and maybe partly psychological. The reason of this approach was to invalidate all attempts at revision of already taken decisions by the government. In this context the Minister preferred to give a brief description of each project, but the focus was mainly on the direction G. Djumaya-Kochani in the section G.-Djumaya – Tsarevo selo. In support he stressed the economic advantages of the region, the available natural resources and strategic military advantages. A considerable resemblance to the alleged benefits brought forward by the population Piyanets was evident because these areas were close and had common relief and climate. On the Vlahina slopes also grew tobacco, fruit trees, forests and the mineral deposits were studied. The second aspect, which sought to put lawmakers at fait accompli, was the fact that most of the works adopted with the government decree of 3 May, were being implemented. Showing some self-criticism for missing the deadline approved - June 1, D. Vassilev reported with satisfaction the launch on 12 and 13 June 1941 of the projects Momchilgrad-Gyumyurdzhina, G. Djumaya-Kochani and Kumanovo-Gyueshevo. The delay of the Decauville Kulata-Demir Hisar was explained by the presence of many minefields along the route that had to be removed promptly. The main point of the speech was to put aside local interests, as lawmakers focus on public aspirations. The speech seemed to had largely played its role, because the bulk of the MP candidates for the debate refused to participate. The Minister's scenario faltered after a declaration for a short opinion was requested by the Kyustendil MP Peter Mihalev. Contrary to his request, Mihalev made a long and reasoned statement on the spirit of the law in general and in particular for each project of the Government program. Probably, like the Minister, the MP was seriously prepared for the parliamentary debate. His clear focus was also on the disputed area as he extensively highlighted the advantages of the option Dupnitsa – Tsarevo Selo compared to G. Djumaya – Tsarevo Selo. He used a whole arsenal of opinions of railway experts and the position of the local population in Piyanets. A strong trump-card was the fact that a delegation from the Piyanets region had visited ministers and a further study had been ordered. The Defense Minister came with a declaration in support of the Dupnitsa route. The strategic aspect was reinforced by the opportunities for extending the line from Dupnitsa to Samokov and Kostenets and beyond to Thrace, and also to Northern Macedonia through Kyustendil. The passage through the Bobov Dol coal basin was also recognised as a major bonus. The MP Tasko Stoilkov tried to oppose with a mentoring tone, and historical and patriotic statements. His speech was in the context of the ministerial speech, but did not supplement essentially the discussed aspects. The contribution of population between G. Djumaya and Tsarevo Selo to the liberation movement of the Macedonian Bulgarians was brought as a new fact in support of the argument for passage of the railway line through that region. The leaning of MPs to support the government policy was reflected not only by the vote on the first reading of the law, but also by placing the issue for immediate urgent discussion on a second reading. The Vice-Chairman of the National Assembly Dimitar Peshev opposed to this request of Minister D. Vassilev. The MP wanted a new debate in the committee where they could make the necessary assessment. He accused the government of ignoring the opinion of the special committee sent along the routes. The reports of the respective agencies are not in this sense which the Bill exposes. The Ministerial Council delegated three gentlemen ministers out of its members who went to the spot, examined the work and came with a report that is different from what is now inserted in the Bill. D. Vassilev was forced to give explanation for the repeated sessions of the Government on this issue and for his visit with his colleagues Ivan Popov and Slavcho Zagorov on both routes, but he remained firm of his opinion for immediate second reading. This decisive opposition broke the resolution of the Kyustendil MPs and the law was passed with a single significant addition - the line Simitli-Kulata-Demir Hisar included a branch to Petrich . At the next meeting, 222,688,000 leva were voted as extra costs for building projects, which included all the connecting lines to Macedonia . Adoption of the law in the National Assembly ended the opportunity for change of the Government-proposed and Tsar-approved railway policy. Out of these three institutions, the Parliament was assigned the role only to confirm the already established decision. Achieving such a result was not particularly difficult. With the exception of the section G. Djumaya-Tsarevo Selo the other sites enjoyed a significant public support. The outcome of the debates was that a railway junction in the area was G. Djumaya instead of Dupnitsa or Kyustendil. The narrow political motives in this case were not only a leading, but also the determining factor in outlining the long-term goals for Macedonia. The inclusion of all construction sites in the state program and the start of their implementation did not lead to a rapid change of opinion. The dispute was whether all projects could be build simultaneously, or first make one or two, while the others are planned for a later date. The famous journalist and publicist Daniel Krapchev exposed a view giving a priority to connections along the River Struma Valley and the destination Sofia-Kyustendil-Skopie. He defined the line G. Djumaya-Kochani as "local" and recommended speeding the construction of the first two lines at the expense of the others . Let's not waste any energy on secondary and tertiary sites and to concentrate all efforts in these two trunk lines . Railway and military experts also recommended giving priority to both projects, then starting the others. Doubts were expressed as to availability of enough workers and it was recommended to contract individual sections to private enterpreneurs . The strong commitment of the government to build all lines simultaneously, dictated by the desire to demonstrate the Bulgarian government as a bearer of prosperity and progress, posed a risk of dissipation of forces. The state resources were not unlimited, and a significant amount of labor and imported materials were required. The wartime situation was not given the due attention because major upturns at the front were conceivable that could restore the old status quo, as happened during WWI. At the outset, the Bulgarian railway construction policy in Macedonia was ambitious, coherent and maximally comprehensive. The lack of flexibility and prioritisation at a given stage tested the chances for success and the achievement of desired results was placed at risk. The determination of the line directions was accompanied by specific engineering and technical preparation, consisting of construction design, tracing the area and bringing in the necessary workforce. This task is entrusted to the Ministry of Public Buildings, Roads and Public Works and its "New Railway Lines." Department. Old plans prepared during WWI were updated. The initial site inspection was done by the Chief Director of Construction and the Chief Inspector for the Explorations. After them the engineering teams for the final routing did their work. It was planned that 14,000 regular and 35,000 mobilised reservist workers start at the beginning . Management of the formed units was relegated to retired officers and non-commissioned officers . The Skopie governor Kozarov expected that the lines Gyueshevo-Kumanovo and G. Djumaya-Kochani would start with 30,000 labor servicemen and several thousand workers hired from the local population, which would ensure their livelihoods . According to Minister D. Vassilev, about 60,000 reservists laborers were expected to be brought in on all construction sites in the new lands with the total number expected to reach 85-90,000 together with the regular servicemen . The Labour Service was assigned the task of providing the bulk of workers planned. Estimates for the total number of people involved differred substantially, which indicated a contradiction in the statements of the responsible officials. Significant concentration of manpower from other areas required accommodation facilities to provide appropriate living conditions. This implied additional organisation. Recruit workers from the local population at this stage were regarded only as an auxiliary factor and their recruitment only seeked to solve some social problems. Despite the delay, the new rail construction started on 11 June 1941. In August, inspection of the sites was carried out. Minister Vassilev attended the G. Djumaya cross-junction. Work started on the sections Kochani-Tsarevo Selo and G. Djumaya-Krupnik, and the land was surveyed between Tsarevo Selo and G. Djumaya. The start of the Decauville Kulata-Demir Hisar was imminent. Final preparatory works were going on and 5,000 workers were expected to be brought in . The construction of this project was planned to be completed in two months and immediately after that the efforts were to focus on the standard line Krupnik-Demir Hisar. Initial actions were aimed at the easier sections. Such was the approach on the Skopie route, where the section Kumanovo-Kriva Palanka was worked upon, and the River Bregalnitsa construction works were concentrated between Tsarevo Selo and Kochani . The construction of the route in level terrains had some advantages and it was preferred not only because it was much easier. The main part of the workforce are non-combatant labor men, who hardly had the skills to implement more complex engineering structures. Their role was to prepare the route for laying the rails. In the more skilled work they played a secondary function, while experts realised man-made structures such as bridges, culverts, tunnels, retaining walls, etc., which are characteristic of mountainous areas. In the plains, the work results could be achieved faster and could be seen immediately, which was in line with the ambitions of the government to manifest its increased attention to the problems of the population in Macedonia. The standard line G. Djumaya-Simitli was opened on October 9 which was a section along the the River Struma route . Building of the Decauville Kulata-Demir Hisar started last, because of the clearing of minefields, but it was the first railway to be completed. Construction works were initiated on August 24, and the narrow-gauge line was put into operation on 29 November , and on December 8, 1941 it was officially opened by the Minister of Public Works D. Vassilev . The railway was 14.8 km long, with a total of 18.2 km Decauville rails laid including the station tracks; 106,867 cubic meters of earth- and stone-work was carried out, 206,485 wages were given out at the total value of 9,873,985 leva . With its launch the railway connection Sofia-Solun was established, which in this period had political, economic and strategic importance especially since the Mediterranean basin was an arena of combat. It was seen as a temporary solution until replacement with a standard rail. Despite its shortcomings, its commissioning enabled the first direct link between the networks of the Tsardom of Bulgaria and the geographical area of ​​Macedonia. It took more than sixty years to realize this important result of the Bulgarian Railway policy. In a territorial aspect, however, it was important mainly to the Aegean Region. In the annual Government review, the new railways were presented as an important fact for the achievements, as well as for the upcoming efforts. The Prime Minister highly appreciated the narrow-gauge connection along the river Struma. He outlined the priorities for development – first the line Gyueshevo-Kumanovo, followed by G. Djumaya-Kochani and finally Momchilgrad-Gyumyurdzhina . In this context, Minister Vassilev insisted the sum of 1,270,000,000 leva to be paid on the urbanisation of the new lands, including railroad construction . He assessed the budgeted funds for 1942 of 201,000,000 leva for working on the tracks as "very insufficient" and claimed a further 250,000,000 leva for import of rails, switches, semaphores, and other materials from abroad . About 26,000 workers were brought in on the railway construction in 1941 . A contradiction emerged between the declarations and the real capacities. There was not enough money, which affected material supplies. The estimates for the planned workforce were not fulfilled, and even the planned minimum was not approached. Despite the emerging problems the government continued to push for the completion of all started projects and did not lose its ambition and confidence in success. New railways were planned and it was sought to optimize the network to achieve the best possible connection between the lines in the Aegean and Vardar Macedonia. Regulations were improved as a law amendment extended the route of the Decauville Kulata-Demir Hisar . It was extended with about 1 km and additional switches were installed . Negotiations with the Germans were conducted for the section Karasuli (today Polikastron)-Kilindir (today Kilindia) on the Greek territory. Demands in Berlin were made for the supply of rails for tracks . In this respect the Council of Ministers voted a decree to build as soon as possible the standard line link between Dedeagach-Poroy and Skopje-Gevgeli lines . Despite the problems with the Italian plans in the region of Kosovo, the industrial Decauville Kacanik-Strъbtse (Shtrъbtse) was started . 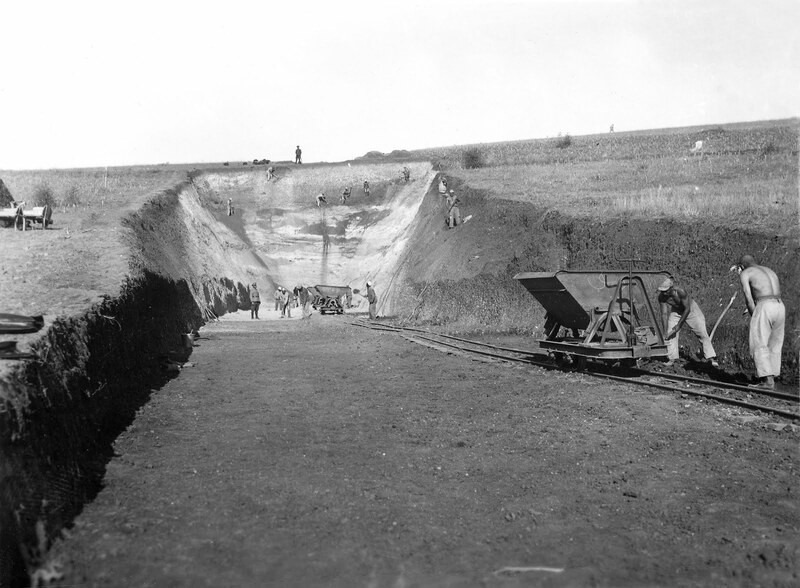 Busy traffic and coal transportation were the reasons for building a second line between Sofia and Pernik. It was not parallel to the first, and started from the village Voluyak reaching the village Batanovtsi, with a projected extension to Radomir. Through its implementation two independent lines would lead to the capital, which could significantly relieve congestion. 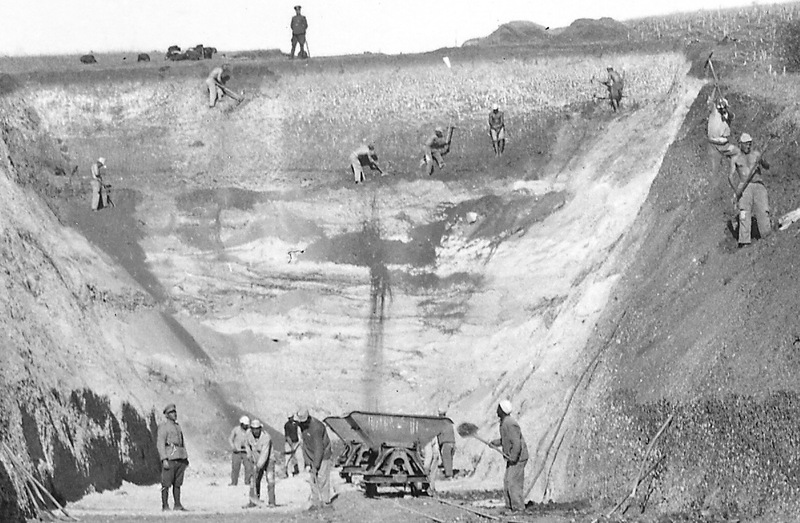 Following the opening of works along the Skopie and Struma directions it was expected to increase further the volume of shipments and the doubling of the railway was a logical preventive measure . Implementation of the connection with the Aegean through a Decauville partially satisfied the governing officials, but efforts were directed towards replacing it with a standard line. At the beginning of 1942 the section Simitli-Krupnik began operation , and in April the construction of the entire route between Krupnik and Demir Hisar was launched. The most serious challenge was the trans-pass of Kresna and Rupel Gorges, where tunnels and bridges were planned. The site was also divided into sections, and the problem emerged for providing enough manpower. Labor servicemen, mobilized civilians and wage workers were the main categories of the drawn workforce. At various times, entirely or partially were brought in the First, Seventh, Twelfth, Thirteenth, Nineteenth, Twenty-first, Twenty-third, Twenty-fourth and other labor battalions . noted an activity report . The reasons lied in the sparsely populated areas and the profitability of tobacco that people preferred to construction. A supply of workers from other regions was needed . Mobilized civilian professionals received appropriate wages, but apparently there was no particular interest, because the Cabinet voted for a number of decrees with administrative measures to compel them to work on the sites . Jewish labor brigades were concentrated on the railroad Krupnik-Demir Hisar as regular workers . Serbs from Morava Region were also involved in the construction . The strategic advantages of Struma direction were appreciated and it gradually became a state priority among sites in Macedonia. Bulgarian representatives repeatedly put demands on the German side to supply the necessary materials. By the "global deal" or other forms they called for the delivery of 121 switches for this direction . Minister Vassilev planned for the line to reach Levunovo by the end of 1943 . The priority of the Struma direction remained after the death of King Boris, and was supported by Regency and the new cabinets. At the meeting between the three regents and Adolf Hitler, held on March 17, 1944 in Salzburg, the Bulgarian side requested rails, trucks and other materials for completion of the construction works. The Germans promised assistance within their capabilities . The existing labor shortages and imported railway materials affected fully the direction of Krupnik-Demir Hisar. Its primary significance forced the state officials to use to the maximum their opportunities in domestic and foreign plan. Forced labor and labor organised in various forms were an essential tool preferable to self-interest, because the effort for rapid implementation did not allow for delay or additional investment of financial resources. The supply of imported materials relied on Germany, which fully involved in the war, and could hardly satisfy all orders. There was no practical alternative in this plan, at least not inside the countries of the Tripartite Pact. Most of the route in the interwar period was in Bulgarian sovereignty, but time was missed to built a line near the Greek border, passing Kresna Gorge. From this position it was much easier to build a standard rail connection at Demir Hisar. Different opinions appeared on the project Gyueshevo-Kumanovo. They were related to the spe­cifi­cation of the maximal gra­dients and radii of curves, because the route passed through mountainous terrain. Maximal gradients were adopted to be 15 ‰ and minimal curves were up to 500 m in order to achieve higher speed, but this further complicated the route. Radii of 300 m were allowed only in the mountainous area between Kriva Palanka and Gyueshevo . The distance was divided into two sections. Work was started first between Kumanovo and Shopsko Rudari, where only 6 tunnels were planned . 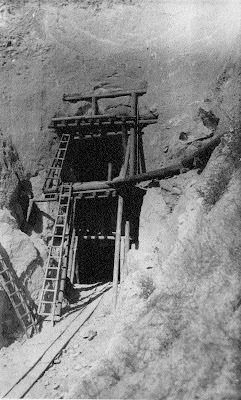 In the other section Gyueshevo-Kratovo the tunnels were 47. 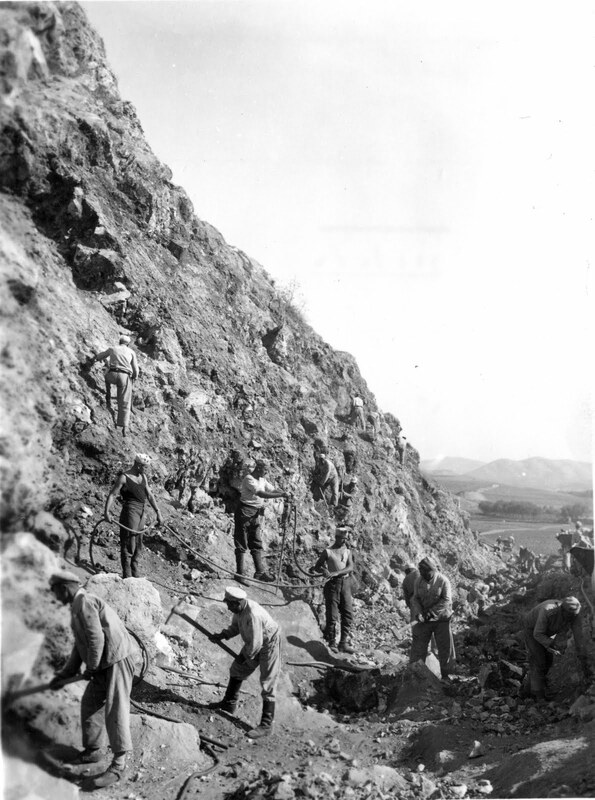 The mountainous terrain required a long preparation, leading to some delays and the first sod was turned on February 9, 1942 in Kriva Palanka . Attention was directed to tunneling, and a record 8 meters progress for 24 hours was reported. Accidents happenned, resulting in death. Workforce appeared to be in sufficient quantity, which initially satisfies the demand, because the region was poor and the indigenous peoples were willing to participate in construction. The attempts to shift people to St. Vrach (today Sandanski) failed, because they all wanted to stay close to their homes. The average daily workforce was about 1,600 people, reaching up to 2,100 people Seventeen food kitchens were opened . The most serious challenge was the 2,362 m long watershed tunnel into the "Deve Bair" locality near Gyueshevo . The company "Grün & Bilfiger" was a contractor at the site and it gave the hired master bricklayers and plasterers daily wages of between 160 and 240 leva, free accommodation and food at low prices. The track is inspected repeatedly by Minister Vassilev . At the railway line Gyueshevo-Kumanovo the Ninth Labor Battalion was located . A civilian mobilization was carried out and additional forces were brought in. Duty evasion and concealment became apparent, or finding reasons, such as harvest, health, not to appear at work . Efforts were underway to attract master masons, miners, diggers, tinsmiths, and brick-bakers . Calorie requirements necessary for each worker were issued by public authorities, commissariat was established and a mandatory social insurance was required . Most of the problems on the site were similar to those of Krupnik-Demir Hisar. The population in northeastern Macedonia was significantly poorer and with fewer opportunities to find work, which facilitated its involvement in the construction. Because the Skopie destination was a priority of Bulgaria before the wars, the railroad operated close to the border. The starting position was good, but serious obstacles remained to overcome, including the watershed tunnel. On the other hand, the need for link to Central Macedonia became secondary to the route to the Aegean Sea. These two directions were approved and their realisation became paramount. 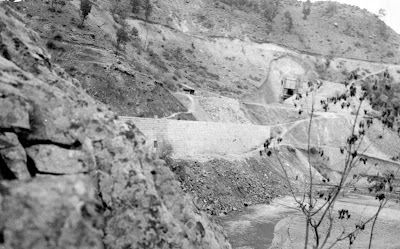 The railway line Kocani-G. Djumaya had two sections separated by the watershed tunnel under Vlahina Mountain. The section from the direction of Kochani and Tsarevo Selo included 45 tunnels with a total length 11.5 km, of which 16 were at some stage of construction. The most difficult areas were in the Bregalnitsa river gorge at Istibanya and on the slopes of Vlahina. Problems arose with the lack of truck tires, and bad food and timber supply roads. The presence of pine forests in the region was used to build a sawmill with which this issue was resolved. Employees were hired along the track, and mobilized civilians were brought in . Third, Fourth, and Sixteenth Work Battalions were located at the site . Its characteristics were very similar to those of Gyueshevo-Kumanovo. 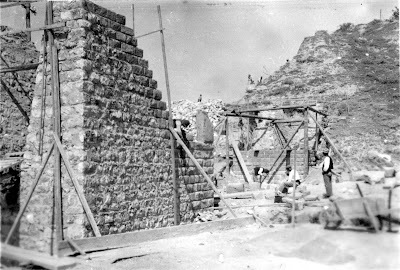 Despite existing problems with material supply and labor, construction of facilities did not stop. Among the completed construction projects was the restoration of the line Karasuli-Kilindir, that was removed by the Greeks after the WWI. It was a direct link built in the Ottoman period to connect the railways in the Vardar valley with the Aegean Coast, but with no connection to Solun. Because this link was on Greek territory, Bulgaria not only engaged with the construction of the line, but conducted the whole operation from the border at Poroy through Kilindir to Karasuli. The restoration of the section with a length of 26.5 km started on 15 July and ended on November 15, 1943. Work along the route was carried out by 1,200 labor servicemen, and second-hand rails, from Bulgarian Rail, were installed by about 120 professionals . The railway was worth 65,000,000 leva . The need of this line outweighed the serious risks of loss of investment. The track was not even on the territory under Bulgarian control, and lay entirely in the Greek zone and there was no guarantee for retaining control even under the most favorable circumstances. The urgent need is evident from the fact that despite the request for rails, imported from Germany, those were not awaited. The line was built with the available second-hand rails, removed from other Bulgarian railways. 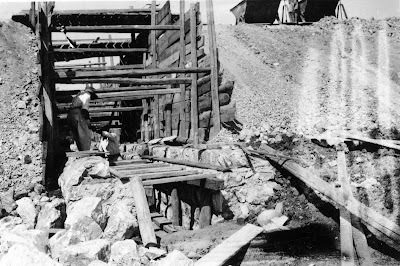 During the war, construction of narrow-gauge line along the river Mesta Valley con­ti­nued. On March 3, 1943, the section Bansko-Belitsa with a length of 18 km was introduced into service and efforts were directed to Dobrinishte . The line was seen primarily with a local economic im­por­tance. This seems the reason that at this stage no attempt was made to extend it to the planned point Nevrokop with a possible extension to the standard railway at Drama. Losing the war forced the new Fatherland Front Government to prepare in detail for the upcoming peace conference. It made a number of analyses, including a report on financing the annexed territories prepared as early as March 1945. It gave specific details of the railway constructions undertaken. By the exit of Bulgaria from the Hitler coalition in early September 1944 two short connecting lines had been completed and opened – Kulata-Demir Hisar and Karasuli-Kilindir. In the most advanced stage was the standard line Krupnik-Demir Hisar. Along its 81 km 4,469,725 cubic meters of earthworks and stone works were carried out, 97,039 cubic meters of concrete and masonry work was completed, 36.6 km track were laid, 5,512,750 wages were used totaling 244,746,523 leva . The two sites in Vardar Macedonia were also at different construction stages. The priority Gyueshevo-Kumanovo had a length of 105 km, 1,569,077 cubic meters of earthworks and stone works were carried out, 29,729 cubic meters of concrete and masonry work was completed. 2.4 km tracks were laid. 2,337,719 leva wages were given and a total amount of 525,974,673 leva was spent. There was a weaker activity along G. Djumaya-Kochani line. Along the 127 km 1,107,266 cubic meters of earth and rock work was carried out, 14,314 cubic meters of concrete and masonry work was completed, and 130 meters track were laid. 1,679,793 leva wages were used, totaling 313,365,208 leva. During the war, the German company Told built in the Bulgarian-controlled region in Kosovo the narrow-gauge line Shtrъbtse Kachanik with a length of 32 km, which was purchased by the Bulgarian Railways for 80,000,000 leva . At the line Momchilgrad-Gyumyurdzina only 40 km were surveyed and 16.6 km were built, altogether worth123,840,899 leva . After 1944, the lines in Pirin Macedonia were completed. The standard line Krupnik-Kulata became operational, but although it was ready during the war to the south towards Demir Hisar, it was not connected, and remained interrupted until 1965, when it was opened after a Bulgarian-Greek agreement. The last stretch of narrow-gauge line along the river Mesta from Bansko to Dobrinishte with a length of 6.8 km was built . The net investment in the new lands, contributed by Bulgaria amounted to 38,600,000,000 leva. The total amount invested in railway construction by the Ministry of Public Buildings, Roads and Public Works was 2,297,801,288 leva, which is two thirds of the about 3,500,000,000 leva spent on construction by this institution . Together with the line Karasuli-Kilindir worth 65,000,000 leva financed by the budget of the Ministry of Railways, Posts and Telegraphs, the total reached 2,362,801,288 leva. Of these, with the exception of two sites – in Western Thrace and Kosovo, which cost a total of 203,840,899 leva, in Macedonia were spent 2,158,960,389 leva or over 91% of total investments. This amount is about 5.6% of the net 38,600,000,000 leva invested by Bulgaria in its controlled lands in the period 1941-1944. This achievement is comparable to WWI, when also about 90% of the railways were built in Macedonia. The construction of connecting lines occupied a central place in the Bulgarian railway policy. Despite the provisional status of the new territories, the risk of its change was not taken into account and the implementation of a major program was started. Several reasons justify its development, allowing for the admission of various hypotheses. It was influenced by accumulated failures in the past, among which stand out the delay in construction along the River Struma Valley towards the border with Greece. In another starting position similar to that of the Decauville it would be possible to complete the priority connection to the Aegean at Demir Hisar. Significantly different events could occur if it was approached according to the assessment of a number of professionals and public figures and instead of four sites, the efforts were focused on two sites. Weaknesses can also be found in the prior provision of imported materials, which in time of war are much more difficult to obtain, and in the organization of labor resources. This criticism applies in full force on projects in the old borders of the Tsardom, while the situation in the new lands was significantly more dynamic. Ignoring the wartime territorial status quo and its perception as the final position entailed an euphoric and ambitious policy. Resources were spread over several sites instead of focusing on key priorities. The results are a fact, but they have lower quality attributes than if the successful completion of major projects was achieved. The Bulgarian railway construction policy was formulated and managed by the Government and the Monarch, while the Parliament had to play a minor role. Political motives were put in the foreground, pushing aside economic conditions and technical specifications. Weaknesses affected the achievement, but after the Liberation only in the two world wars Bulgaria had the opportunity to develop its own railway construction in Macedonia. A direct link between Sofia and the Aegean was achieved. Efforts in 1941-1944, however, did not give the expected result. Despite the almost ready for normal operation line along the Struma and the operating Decauville the Aegean railway communications were interrupted after restoration of Greek sovereignty in the region. Attempts to renew the work on sites in Vardar Macedonia also failed. After the war, Bulgaria again had no direct rail connection to the network in the geographical area of ​​Macedonia. † The standard gauge is 1,435 mm (4'8½''). Anything below it is narrow gauge. Decauville railways are the narrowest gauge, usually 600 mm (1'11⅝''); the first Decauvilles were 400 mm (15¾''), and then 500 mm (19¾''). * The material has been published in: Scientific Proceedings of Law and History Faculty of the Southwestern University "Neophyte Rilski", year 6, vol. 1-2, Blagoevgrad, 2010, pp. 225-239. ** Ph.D. Dr. Angel Dzhonev is author and coauthor of several books. The last of them was Macedonia in the railway policy of Bulgaria (1878-1918). 1. Central State Archives (CSA), f. 176k, op. 8 a.e. 931, l. 61; see the actions taken in more detail in: The National Liberation movement of the Macedonian and Thracian Bulgarians from 1878 to 1944. Vol. 4. Sofia, 2003, 344-361. 2. Dzhonev, A. Macedonia in the railway policy of Bulgaria (1878-1918). Thesis. Sofia, 2007. 3. CSA, f. 157k, op. 1 a.e. 1024, l. 1b. 4. Rail transport in Bulgaria. Sofia, 1987, 52-53; Deyanov, D. Railway network in Bulgaria from 1866 to 1975. Sofia, 2005, p. 172. 5. Zora, issue 6577, 20 May 1941.; Issue 6610, July 1, 1941.; Issue 6613, July 4, 1941; Gornev, R. Railways in Skopie railway area. - Review of the state railways and ports in Bulgaria, 1942, No. 1-2, 4-24; No. 3-4, 16-29; No. 5-6, 39-50. 6. Zora, issue 6629, July 12, 1941; Gornev, R. Railways in Aegean Thrace and eastern Macedonia. - Review of the state railways and ports in Bulgaria, 1943, No. 3-4, 28-38; No. 5-6, 11-18. 7. CSA, f. 176k, op. 8 a.e. 1057, l. 6-12. 8. CSA, f. 307, op. 25 a.e. 45 l 308-309. 12. Bulgaria as a wayward ally of the Third Reich, p. 78; Noykov, St., V. Radev. King Boris III in the secret documents of the Third Reich from 1939 to 1943. Sofia, 1995, p. 155. 13. CSA, f. 176k, op. 8 a.e. 1057, l. 1, 3, 19-26, 35, 37, 39-40, 42, 48-55; Diplomatic documents on the participation of Bulgaria in the Second World War, p. 214, 235-236. 14. Bogdan Filov. Dnevnik. Sofia, 1990, pp. 493, Dimitrov, I. Bulgarian-Italian political relations from 1922 to 1943. Sofia, 1996, 357-359. 15. CSA, f. 176k, op. 8 a.e. 1120, l. 89-94. 16. Sazdov, D., P. Penchev. Danube Bridge: 100 years diplomacy and politics. Sofia, 2006, 143-144. 17. Bulgaria as a wayward ally of the Third Reich p. 56, 188, 201, 203, 219, 236. 18. History of the Kyustendil District organization of the BCP. Sofia, 1984, pp. 341, 345. 19. Toshkova, V. Draft of the U.S. Department of State by December 1943 for control of Macedonia after World War II. - Centuries, 1979, No. 5, 65-66. 20. Archive of the Ministry of Interior, Ob-1156, L. 82-87. 21. Zora, issue 6596, May 10, 1941; Shorthand records of the 25 NA, II extraordinary session, fifth session, July 13, 1941 Sofia, 1942, pp. 131.133. 22. Nedkov, T. The Aegean and Macedonian railway networks. - Our Railways, 1941, No. 8-9, 3-5; Balevski, K. Fast and overall organization of the building and management of newly projected railways. - Review of the state railways and ports in Bulgaria, 1941, No. 5-6, 185-191; Danchov, Y. New Railway lines for the liberated areas. - Journal of Bulgarian engineers and architects, 1941, No. 9, 122-124; A. Prahov. New railway lines connecting the Aegean Thrace and Macedonia with Bulgaria. - Journal of Bulgarian engineers and architects, 1941, No. 10, 142-145. 23. A. Prahov Ibid. cit., 142-145. 24. CSA, f. 1335k, op. 1 a.e. 145 l 1. 25. Bogdan Filov. Diary ..., p. 355. 26. Shorthand records of 25 NA, II extraordinary session, fifth session, July 13, 1941 ..., 131-138. 27. Ibid, sixth session, July 14, 1941, pp. 156. 30. CSA, f. 1335k, op. 1 a.e. 146 l 1-4; Danchov, J. op. cit., s. 123; Balevski, K. op. cit., s.189. 39. Ibid, issue 6743, December 9, 1941; Deyanov, D. op. cit., s. 191. 40. Archive of the Ministry of Foreign Affairs (AMVnR) u. Paris Peace Conference (PLA), Op. 1 mo. 6 a.e. 108 l 128. 41. Filov B. Way of Bulgaria. In the great tests of greatness and progress. Sofia, 1941, pp. 33. 44. CSA, f. 176k, op. 8 a.e. 1060, l. 2-3. 46. CSA, f. 157k, op. 1 a.e. 1006 l 1a. 47. Diplomatic documents for the participation of Bulgaria in the Second World War ..., p. 193. 49. State Gazette. 148 July 9, 1942; Diplomatic documents for the participation of Bulgaria in the Second World War ..., 299-300. 50. Radoslavov G., On the rail crossroads between East and West in the Balkans. (On the issue of construction of the railway network in southwestern Bulgaria.). - In: Postwar Bulgaria between East and West. Sofia, 2005, 297-299. 51. Deyanov, D. op. cit., s. 191. 52. AMVnR, u. PLA, a.e. 633, l. 37; Brief History of building troops of Bulgaria from 1920 to 2000. Sofia, 2000, p. 92, 98, 101, 107, 111, 113. 53. CSA, f. 157k, op. 1 a.e. 1016, l. 1. 54. CSA, f. 157k, op. 1 a.e. 1122, l. 1a. 55. SA, Kyustendil, f. 25k, op. 1 a.e. 124 l 26-28, 89. 56. Jews died in the struggle against fascism. Sofia , pp. 244. 57. Lieutenant General Nikola Mihov. Diary 19 September 1943-7 September 1944 Sofia, 2004, p. 96. (Preface and notes Ts. Biliarsky). 58. CSA, f. 316k, op. 1 a.e. 313, l. 69. 59. Lieutenant General Nikola Mihov. Diary ..., p. 16. 60. Ibid, pp. 36; Toshkova C. The foreign policy of the Government of Dobri Bozhilov (September 1943-May 1944). - Historical Review, 1974, No. 2, p. 27; same. Bulgaria and the Third Reich. Sofia, 1975, p. 172. 61. CSA, f. 678k, op. 3 a.e. 65 l 74-78; Danchov, J. op. cit., 123-124. 62. For the technical parameters of the section-Kumanovo-Shopsko Rudari see in more detail: CSA, f. 157k, op. 1 a.e. 998, a.e. 1021, a.e. 1027. 63. Zora, issue 6796, February 17, 1942, CSA, f. 157k, op. 1 a.e. 1017, l. 1. 64. CSA, f. 157k, op. 1 a.e. 1017, l. 1-5, a.e. 644 l 4, 5, 6, 10, 12, 32, 54, 57, 71, 79, 80, 116, 119, 120, 123, 232, Deyanov, D. The railroad Gyueshevo-Kriva Palanka-Kumanovo-expects completion already 50 years . - Rail, 1993, No. 6, 22-26. 66. Kyustendil News issue 22 October 15, 1943, CSA, f. 157k, op. 1 a.e. 644 l 127. 68. State Archives - Kumanovo, Macedonia, f. 113, op. 2 a.e. 337, L. 429-430, a.e. 434, l. 452, a.e. 346, l. 4; a.e. 347, l. 5; a.e. 348, l. 5; a.e. 351, l. 32 SA-Kyustendil, f. 25k, op. 1 a.e. 124 l 89. 69. SA Kyustendil, f. 25k, op. 1 a.e. 125 l 7, 49-51. 70. State Archives - Kumanovo, Macedonia, u. 113, op. 1 a.e. 207, l. 6, 28, 29, a.e. 62 L. 171-172; a.e. 63, l. 173; a.e. 131 l 246. 71. CSA, f. 307, op. 84 a.e. 6, l. 2-5, 12-13, 18a., U. 157k, op. 1 a.e. 1007, a.e. 1023. 73. 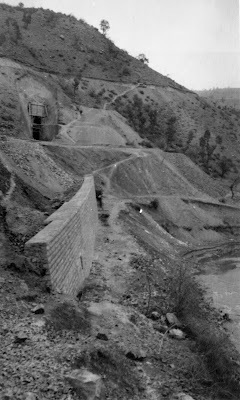 Gornev, R. Restoration of railroad Karasuli-Kilindir (Polikastron-Kilindiya). - Review of the state railways and ports in Bulgaria, 1944, No. 3-4, 21-27; Brief History of building troops of Bulgaria ..., p. 102. 74. AMVnR, u. PLA, op. 1 mo. 6 a.e.108, L. 132. 75. Deyanov, D. The railway network in Bulgaria ..., s. 196. 76. AMVnR, u. PLA, op. 1 mo. 6 a.e.108, L. 128. 79. Rail transport in Bulgaria ..., s. 43, 53. 80. AMVnR, u. PLA, op. 1 mo. 6 a.e. 108 l 123-124. Copyright (c) 2009 Lyudmil Antonov. All Rights Reserved. Last updated 2011-03-15. Mnogu ste napravile,pa zatoa Makedonija seuste ne e povrzana so Bugarija so zeleznicka pruga.Nemoj da kazete deka e toa problem na Makedonija - prugata na bugarska strana ne e ni zapocnata. Sofia-Kyustendil-Gyueshevo-Kumanovo was finished by Bulgaria in 1944 as written in detail in the text. The Bulgarian government planned to extend this line to Skopie. Trains were running between Sofia and Kumanovo then. At the end of the war, the border was erected just behind Guyeshevo and the train station in that village lost its function although it is still there today. So yes, Bulgaria did very much to connect all Bulgarian lands including Vardar Macedonia. For these efforts, instead of gratitude Bulgaria is faced with offence and spite by the state-controlled media in Macedonia. This is the problem, and it is a problem of Macedonia, not of Bulgaria.